Blizzards And Shutdowns And Fourloughs, Oh My! I was given an assignment to do another post on food storage. I do these frequently for Augason Farms because, like them, I believe strongly in being as prepared as is possible. No one will be completely, 100% prepared. I think part of many people’s overwhelmed response to food storage and emergency supplies is that they think they need to have it all perfectly set up and that they just can’t pull that off, so they give up on making an effort. People, you weren’t prepared to leave home when you grew up. There were lessons to learn, mistakes to make and experiences to have. But, those situations in which you were not prepared did not lessen the value of the things you were prepared for. Whatever skills you could bring to the table helped you make your way until you could figure out the rest of it. I was very prepared to have children, but not completely. What I had learned helped me to be a better mother and led the way for the rest of the skills I needed. If you are in a situation where you are suddenly not getting paid, whatever supplies you have on hand will help. If you are stuck in a blizzard like I was a week ago, with no power and the heat rapidly dropping and a house full of hungry children, you will be infinitely better off with one flashlight, a few blankets and a few packages of instant soup than you would be with nothing. I firmly believe that effort is blessed. I live my life by the principle that if I try, God will make up the rest. And He does. So, stop trying to be perfectly prepped. Lose the expectation. Stop being overwhelmed and ask yourself what can I do, rather than focus on what you can’t do. Life is too uncertain to not at least try. In the past few weeks we have been in a terrible blizzard that decimated tens of thousands of the cattle where I live and forced many people to survive without power or access to anything except what was on hand for several days. Being military, they have threatened not to pay us over the shutdown, fixed that, and are now saying again that if the US defaults, we can again expect no paycheck. My foster children, who depend on programs like WIC for their formula, cannot get it through the program they are supposed to be supported through due to the shutdown. That need now falls on me. I am not perfectly prepared to handle all of this. But I am confident that through the many preparations I have made, the skills I have learned and the resources at my disposal – we will be ok, and in many instances, even comfortable. So- TRY. Baby steps. Leap of faith. Effort is always blessed. Always. Without further ado, (and, yes I know that was a lot of ado) here are some super yummy food storage recipes and ideas for you to try. Because I got to figure out how to eat with nothing but a burner during our power outage, I’m going to point out some fantastic products for you to stock up on, in case you end up in that boat. We are going for easy-peasy power-outage meals that only require one burner. 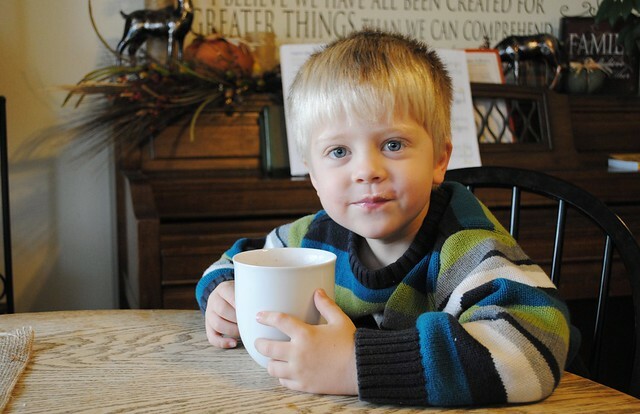 First off, I want to show you these awesome soups from Augason Farms. 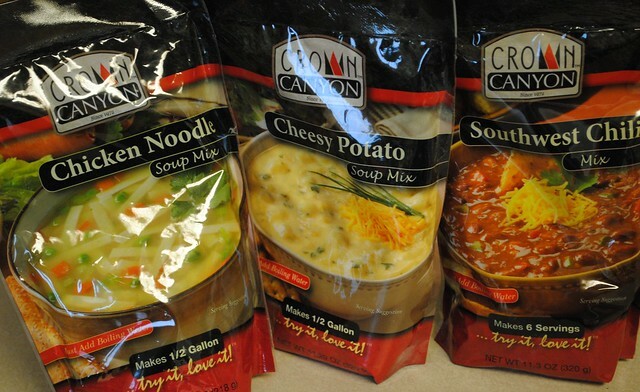 Crown Canyon is their new soup brand and these were a huge hit with my entire family during this past power outage. Hot, yummy, and as easy and mixing the packet and some water together. We have also brought these with us on several camping/backpacking trips. Lighter than their canned counterparts, and containing several servings, you definitely want to add some of these to your 72 hour kit and pantry. The Cheesy Potato and Chicken Noodle have been our favorites. My eleven year old frequently whips one of these up when he is hungry or babysitting. We have a few of these 12 day emergency pails on hand, as well as the 72 hour ones. They provide enough food, with a basic plan of what to eat when, for one person for 12 days. You can buy them for 3 days, 12 days or 30 days. I like these because they are great on the go, and take the stress of constantly trying to figure out what to eat next away. These are perfect for short term disasters. These entree in a can are also really great in a pinch, particularly if you are trying to feed a family, and don’t want to deal with (or lack the resources to deal) a messy prep and clean up. These one can wonders come in several family favorites: chicken fettucini alfredo, beef teriyaki, chili macaroni, and more. Times calling for food storage tend to be stressful, and simplicity, along with comfort foods are a great way to take the edge off and reserve your energy for other issues. 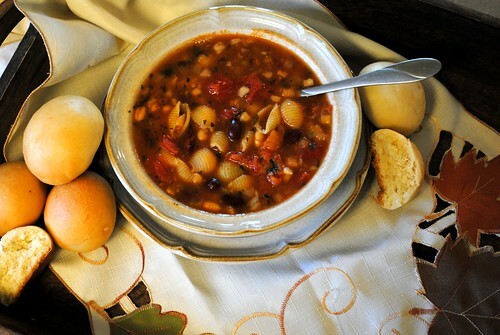 And finally, how about some minestrone soup? 1 cup pasta- I like the traditional shell pasta. This is simple to make, filling and surprisingly meaty for a vegetarian meal. So get started! Get that pantry stocked, even if it is one can at a time. And take advantage of the October sale at Augason Farms! 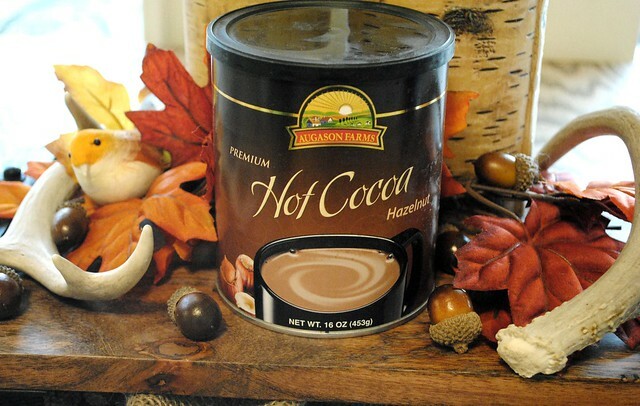 30% off Cocoas, Morning Moos and Soups! Comment on Blizzards And Shutdowns And Fourloughs, Oh My!